'Jingle bells, jingle bells, jingle all the way - now it's less than a month until it's Christmas Day!' To be sung to the usual tune please - after me now :) I think a touch of hysteria is setting in here to be honest - tons still to do before Christmas but am sure we'll manage somehow! 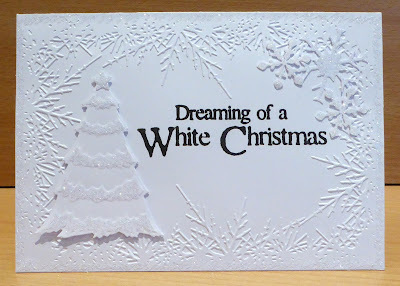 I'd like to enter this card into the current challenge over at Craftyhazelnut's Christmas Challenge where this week's theme is 'use die cuts and/or punches' as well as Craftyhazelnut's Christmas Challenge Extra for November where it's always 'anything goes'. Why not play along too? I just bet you can't avoid thinking of Christmas now we're almost into December - help! Barb made this great stepper card, using the Presscut dies set that quite a few of us fell in love with and rushed off to buy after seeing Liz using it! 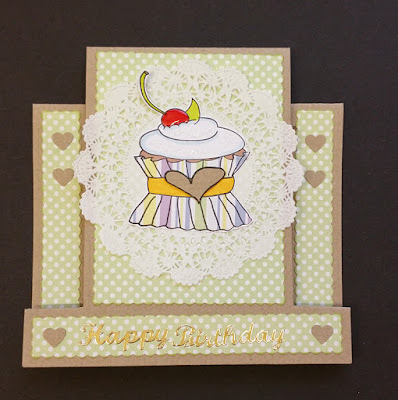 I also chose this card as combining the cupcake and the doily is such a fab idea - one I've never thought to do! We had some banter going on during the week - Carole was going to audition for the role of Rudolph in the Nativity Play (some poetic licence I think 'cos am not sure that Rudolph actually did go to Bethlehem) - this was due to her having a really bad cold and the resulting dreaded red nose - and from my visits I know that many of you girlies have had colds and flu or worse this week. Come on - get well for Christmas please! SaRn cheekily suggested there might be a role for Rudolph the red toed reindeer played by yours truly! It's still a possible although each day sees a teeny bit of improvement! I've included this card, made by Susan (rainy) not only because I love it loads - but also because of the fabulous idea Susan shows. How clever is that to take the matching die to a stamp, cut it and then split it in half and separate the two halves for massive impact? Great way to add such a different twist! I thought it would be appropriate to bring us back to a great way to use up lots of little snippets - Sandy made this great patchwork card and I love it! Very cleverly, the 'patchwork pieces' were assembled onto adhesive paper leaving slight gaps for the sparkly glitter to be added. Clever touch! First of all, I adore this card made by Andrea (Kanda) - someone else who's been suffering this week. I wish I had shares in Kleenex right now! 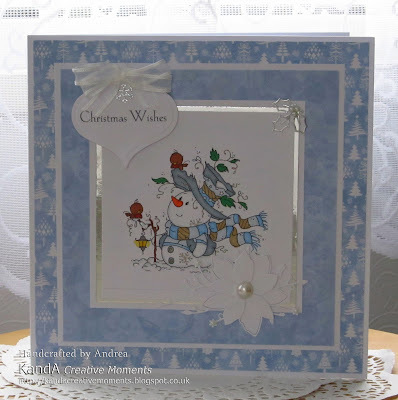 A darling image and of course the LOTV blue papers are just lovely with the white, silver and the poinsettia. But there's such a neat trick - I wonder whether you spotted it? It's the way that Andrea used a bauble die cut out and then stamped her sentiment onto it. I think it's a fabulous idea for Christmas cards, and one I wouldn't have thought of in a million years! I do hope you've enjoyed seeing this week's picks - as always I ponder long and hard. Every single entry is worthy of being a pick, every week. I think I've said before that I make up a pretty long list of possibles during the week as I'm commenting and then have the hard job of paring it down to manageable numbers on Saturday mornings. I do try very hard to make sure that I don't always pick the same playmates each week - although sometimes that's a really hard call of course. And, I look for inspiration, new and different ideas, how to use your goodies, techniques, tips - and of course ways to use up those snippets :) Oh, and of course cards and makes that just have that WOW factor. Every one of you has that! I've seen Bozena's lovely work around blogland and was so pleased to see her join us this week, bringing such a stylish card too. 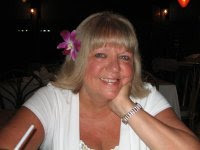 Welcome to the Playground Bozena and hope to see you again soon! As you can see, Hazel squeezed into the Playground right at the end at around 10am yesterday morning - which proves that it's never too late to link up if the Playground is still open! It's absolutely ages since Hazel last won in the Playground, around two years according to my little book, and it's really nice to see her winning as she puts so much time and effort into running a good few challenges herself. Well done! Hazel, I only have your previous address from your last win so can you please drop me an email (see the paragraph below) with your new one and the prize will be posted off to you ASAP this week. The Snippets Challenge will run for one week and the Playground gates will close at 11am UK time on Saturday 5th December. The gates will open again at midnight UK time on the same day. Maximum of three entries and please say in a comment if you wish to play and be a possible winner of the prize. Do say if you only want one or other part of the prize (the stamp or the die) but both are up for grabs as one prize of course and will only be split if the first name out only wants one or other of the items, in which case I'll do a second draw for the other part of the prize. And please also link back to the Playground in your blog post to be eligible for the draw. Di and of course, Parsnip! It's Rudolph Day over at ScrappyMo's, the last one of the year and the challenge runs until the end of the month (Monday). Two lovely prizes to be won as well! Sigh, I don't think this card will qualify after all - so annoying as I almost dry embossed the letters in the word JOY. That'll teach me to read the brief properly. I know there's texture when you rub your hand over the raised surface created by the large die sitting on the white background - but am not sure that's good enough :( Oh what the heck, I'll link in anyhow - the thought was there! For my card I used a lovely die that was offered as a Playground prize a couple of months ago. I really do love the die but am realising that there's only so many ways you can use it - perhaps that's why it was on sale (and still is BTW) over at Sizzix. One more Christmas card to make and the target of 132 over 11 months will have been reached - yay! The current challenge over at Less is More is 'Numbers'. Bit of pondering here as we don't have any special Birthdays or Wedding Anniversaries on the radar where I'd usually use numbers. After several protracted phone calls to the docs surgery yesterday (with the tenacity of a terrier!) finally found out that this 'ere big toe/trotter is showing up on the x-rays as not broken but with 'changes consistent with osteoarthritis' (which I already have elsewhere so no real surprise about that). Wahoo - a relief there's no pockets of infection or a fracture showing up though! So, for now, it's a case of continuing with the painkillers and anti-inflammatories whilst things hopefully settle down again after what still seems to have been gRout. Appointments are still lined up for repeat blood tests, progress trips to the doc and also rheumatology at hospital (apparently it could be months for that appointment to come round!). 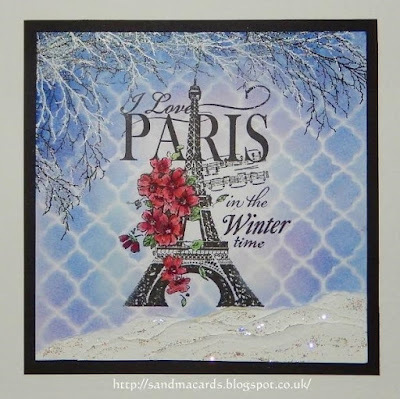 The current challenge over at Cuttlebug Mania is 'Embossing', a nice open theme this fortnight so the World is your oyster really! You do have to use a manual die cutting/embossing machine (it doesn't need to be a Cuttlebug but it must be manual, not electronic). And, you can't mix the two, it must be all manual please. 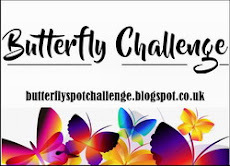 Then make your entry, link into the challenge, link to the challenge in your own blog post and and make sure that you also say what products you used for any die cutting/embossing. 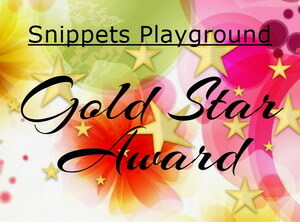 Your turn now - and of course if you use even just one snippet then you can come and play in the Snippets Playground. The 'trotter' update: results aren't in from the hospital yet, my doc wasn't in yesterday but has been left a plea from me via the practice reception to go into the hospitals online system tomorrow to check out the x-ray results. Yikes, not much more than a month to go until Christmas now and no doubt Rudolph is already limbering up for his big night leading his mates around the World. I know that there has been some casting going on for the Playground Nativity play - needless to say it's already getting a bit very silly, and also very funny :) Well, there's a big surprise - not! I also bet loads of us can remember the magic of watching instant/Polaroid photos appear before our very eyes - also many years ago. Sometimes this blog seems like a walk down Memory Lane, or perhaps a history lesson to the younger ones of you! One thing I would do differently in future when using this die would be to trim the actual image to just a smidgen less than the outside measurement of the entire instant photo frame so that the image then sits 'back' in the frame (and you avoid the sliver thin gap around the image itself) - much as the real thing did in the 'olden days' :) Hindsight is a wonderful thing but I really didn't feel up to fiddling about any more once I realised the error of my ways. 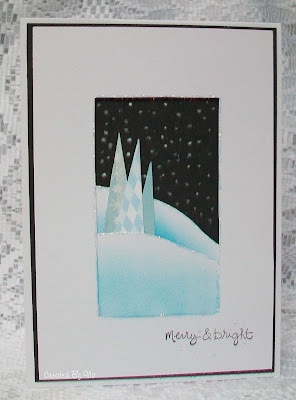 I'd like to enter this card into the current Penny Black and More - 'Anything Christmas' challenge. And also Craftyhazelnut's Christmas Challenge where it's' 'Things with Wings' - plus Craftyhazelnut's Christmas Challenge Extra where it's always 'Anything goes'. This is gorgeous! 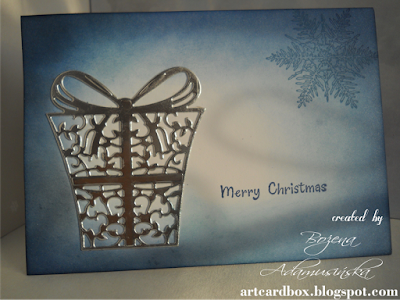 Mary Anne made an amazing Christmas card using a really beautiful basket die, and lots of snippets of course. I really love this card, made by Susan (Rainy). Loads of snippets used of course and how clever to make the tops of the acorns interchangeable by adding little magnets to the backs - a great idea! 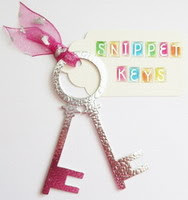 And Eve used the same set from Stampin' Up as well, to come up with this brilliant snippets make. It really shows how the same set of stamps can be used so differently - and loads of scope for even more variations of course. Lots of you, quite rightly, hopped over to Pat's blog to take a closer look at this fabulous card. The poppies are just so gorgeous, and perfectly set off with the embossed zig zag and oval shaped die background - and of course the perfectly toned in butterfly too! This is the very first white on white card made by Liz and it's absolutely fabulous - so elegant and just perfect in every way! Hard to believe that Liz had never made a white on white card before now - what a way to begin! And then, the embossing folder is just stunning don't you think? Sigh, once again I was 'enabled' and just had to go and buy one - plus a spare for the Playground toy box of course. That's one thing about running the Snippets Challenge and looking closely at so many beautifully made and very clever entries. The Playground really ought to come with a bit of a health warning as it's one of the very best places I know to find people happily sharing what new crafting materials they're using. Don't say I didn't warn you! Isn't this wall hanging just adorable? Made by Ileana, I think it's so pretty and that snowman is just the cutest little guy - love the jingle bell as a finishing touch! Tina Z nipped in a couple of times, and this was the lovely butterfly card she brought on her first visit - wonderful die cutting and embossing. What a great Christmas card this is - brought to us by Shirley. I so love the little pops of red against the white, deep blue and silver - and what a fabulous image! This amazing scene was created by Sandma (Sandra) - it's so beautiful and I love how the twigs frame the top of the image and just flow so naturally down the side as well. Barb has been playing along regularly with us since mid-July and this is her first win - so it's really lovely to know that her turn arrived, whoop, whoop :) I don't have your address Barb so could you please drop me an email (di_wray@hotmail.com) and I'll post your prize off ASAP. 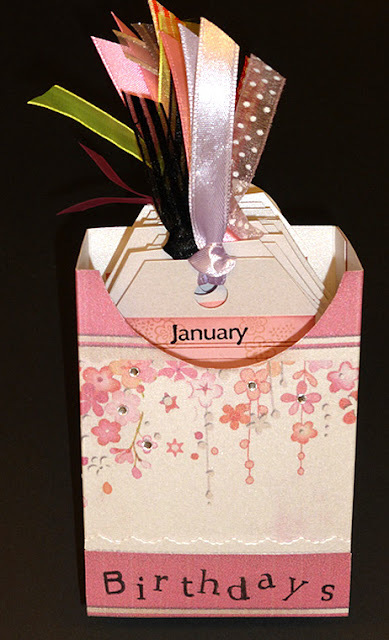 It's a 'Birthday Box' and such a clever way to keep a note of Birthdays for each month of the year, as well as using up snippets of course. Would make lovely gifts as well as sure fire sellers at Craft Fayres - I know that a lot of you have picked up on how clever this idea is - and so pretty too! The Snippets Challenge will run for one week and the Playground gates will close at 11am UK time on Saturday 28th November. The gates will open again at midnight UK time on the same day. Friday saw me at the docs once again, long story cut short - more new meds, and sent off to hospital for an x-ray. Apparently 'something out of the ordinary' does appear to be showing up on the x-rays of said 'poorly trotter' but I won't know just what until Monday as it needs to be properly evaluated. Amazing that it's taken three weeks plus of agony for me to finally be sent for an x-ray - all I want now is to know just what it is, if it isn't gRout/inflammation :) If it's a fracture then at least I might have a head start for Sarn and Mrs A's 'casting' sessions - tee, hee. Remember it's Rudolph Day over at ScrappyMo's from Wednesday until the end of the month and of course it's the last one this year. There's a fabby Memory Box die to be won, and if you hop over now and comment on Mo's post dated 20th November you can also be in with a chance to win a different and equally lovely Memory Box die set in the interim! I'd recently added some Penny Black Stickeroos to an on line order and they were still sitting on my neglected desk here - and amongst them was the sticker I used on this card. Edit: AND, Brenda dropped me a huge hint that a Stickeroo is acceptable over at the current Penny Black and More challenge (which is 'Anything Christmas') so I'm also joining in the fun over there - thanks B! 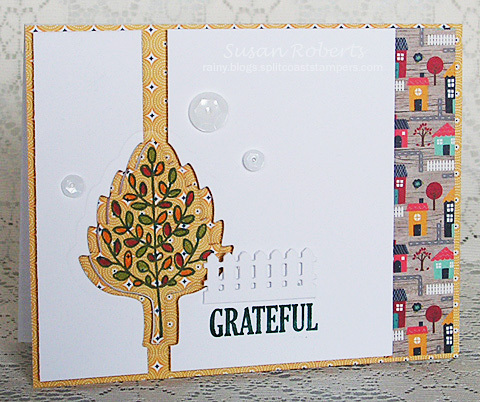 I thought it would be an idea to make her a step card using my own die set - I know that when I first tried my own set out I was so very grateful to have the lovely card that Liz had sent me a little while ago as a reference. It might be 'cos I'm using a Cuttlebug which is really on the edge and quite a snug fit, but I did feel that some of the cut edges on the card itself needed something like a burnishing tool or even a bone folder held flat and rubbed over them just to take away any little lines that you often get when cutting solid shapes. Apart from that - it's a star here! The current 'one-layer' theme over at Less is More is 'Santa'. 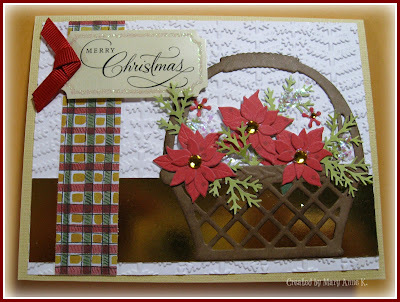 And, over at Craftyhazelnut's Christmas Challenge 255 it's 'red and green must be seen'. 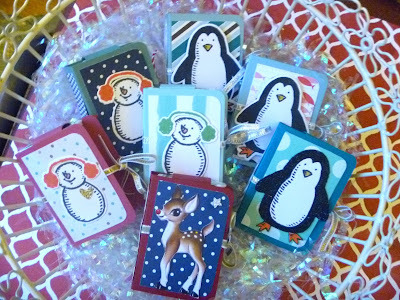 And, it's always 'anything goes' over at Craftyhazelnut's Christmas Challenge Extra for November. What a weird week, at one point I thought the toe/foot was on the mend here - then I got too ambitious and ended up going backwards! Orders to rest properly and also double dose of pills - nice, not! Anyhow, I've managed to keep up with the commenting side of the Playground as well as noting down the picks of the week. But, my snippets card has already appeared (on Tuesday's post for the new Cuttlebug Mania challenge) - so if it looks familiar then you wouldn't be too far wrong! Let's roll straight into the picks for this past week now - and as always you came up with some really stunning snippets makes. My 'first cut' list of possible picks was absolutely huge - and cutting it down became almost impossible. But, it had to be done so here are just some of the makes I'd originally listed - I do so recommend that you try to find time to go and peek at last week's makes, every one should have been included and there are some stunning and very clever ideas! This darling card, made by Jenni, really made me smile. I love those little penguins - and all the little hats are snippets - a real test of patience there Jenni, with a wonderful result. Maura brought us this amazing Wedding card to share - I absolutely love it! Plenty of snippets and such a gorgeous design with the two lovely birds in reversed colourways. I think this card, made by Viv, is absolutely amazing. A perfect example of a really stylish CAS Christmas card using snippets - as my in-house critic would say, it's shop quality. Which IS a compliment! Karen P has been struggling with health issues more than usual lately, so it was especially good to see her hop into the Playground with this amazing mixed media card. LOVE the dimension and how those flowers just pop off the card at you :) Hope you feel more settled with the new meds soon Karen. Kitty is a really regular player in the Playground, often three times in a week - and her makes are so varied too. This gorgeous tag really caught my eye, wonderful colours and such a great design too. We had a lot of tags this past week - and all of them are absolutely fabulous! 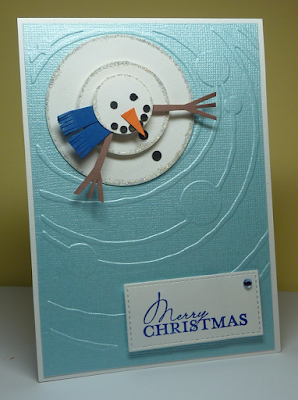 I adore this card, lots of snippety snowflakes - always a great use for white scraps. But, on top of that, do please check out the amazing colouring of that Mo Manning beautiful angel image. Susan (Eden Land Designs) is one of the most talented colouring artists I've ever come across. The tiny details and so many different colours and shades that Susan used are just stunning. Last week was little Daisy's 2nd Birthday, and Jane J made this totally fabulous 'jungle themed' Birthday cake for her party. The level of detail is just amazing - obviously loads of little snippets of fondant icing were used in the process :) To see plenty of photos, taken during the making of this masterpiece, do hop over to Jane's blog - one very talented lady indeed! So folks, it's actually late Saturday afternoon as I'm adding the final touches to this post - it's taken a lot longer than anticipated but I do hope you enjoyed the scamper through the few picks I had time to write about. Oh well done Sue! I'm almost positive this is your very first Playground win, after playing along for quite some time. Wahoo - and I know you've been have a rough time for a while now so I do hope the little meeces will make you smile. Can you please drop me an email with your address in and I'll post your prize off as soon as possible. My email is di_wray@hotmail.com. And, you girlies probably already know fine well that this coming week's prize is linked to my snippets card for today/last Tuesday. It's a real shame but I can't get hold of the Cuttlebug 'Scrollwork' embossing folder for love nor money (I've searched high and low on the internet as it does go perfectly with the sentiment). The Snippets Challenge will run for one week and the Playground gates will close at 11am UK time on Saturday 21st November. The gates will open again at midnight UK time on the same day. Maximum of three entries and please say in a comment if you wish to play and be a possible winner of the prize. Do say if you only want one or other part of the prize (the stamp or the set of dies) but both are up for grabs as one prize of course and will only be split if the first name out only wants one or other of the items, in which case I'll do a second draw for the other part of the prize. And please also link back to the Playground in your blog post to be eligible for the draw. Thank you for all the lovely get well messages - they've brightened some pretty sore days here.